Illinois Pondweed has lance–shaped leaves which come to a point at the end. This submerged pondweed has a stout stem with lance/oval shaped leaves. The leaves have a sharp point on the end and 9- 10 veins per leaf. 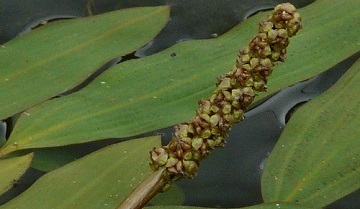 It has many leaves on each stem, but fewer than the Large-Leaf Pondweed which is a very similar plant. Large-Leaf Pondweed has more leaves with each leaf having more veins than Illinois Pondweed. Common throughout United States. Grows in shallow or deep waters and is rooted to the bottom. Sometimes found in quick-moving rivers. Dibrox herbicide, Spriflo herbicide, Aquathol K and Super K can be used to treat Illinois Pondweed.